Set in a white, digitally animated environment, I Infinite is inspired by the digital world’s quest to re-create life. Part dance, part video installation, it explores the boundaries between the artificial and the real, the digital and organic worlds. Audience members, free to roam the space as they please, are invited to stand close to the dancer or just sit, transfixed, to watch the refined movement so often missed in more traditional theatre spaces. 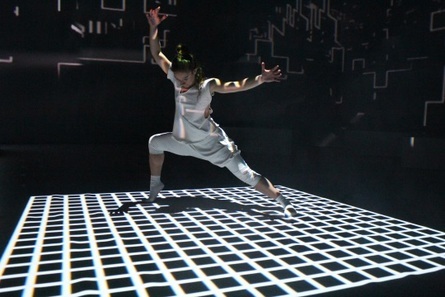 ‘Much more than just contemporary dance…there’s a real harmony between the performer’s choreography and the graphics, a highlight being when she rocks, spins and tips a projected grid on the floor, as if she’s balancing a piece of debris in space’. Design Week. ‘Dance, music, art and design clash in a mesmerising performance piece. A beautiful and sublime experience’ Fused Magazine.